So I was free to create with at least one of these chilly little melons, and I made salad. Salad that is best made on a hot day, (it’s probably hot where you are, right?) but I know from experience, also tastes good when you look outside and can’t believe it’s raining again. 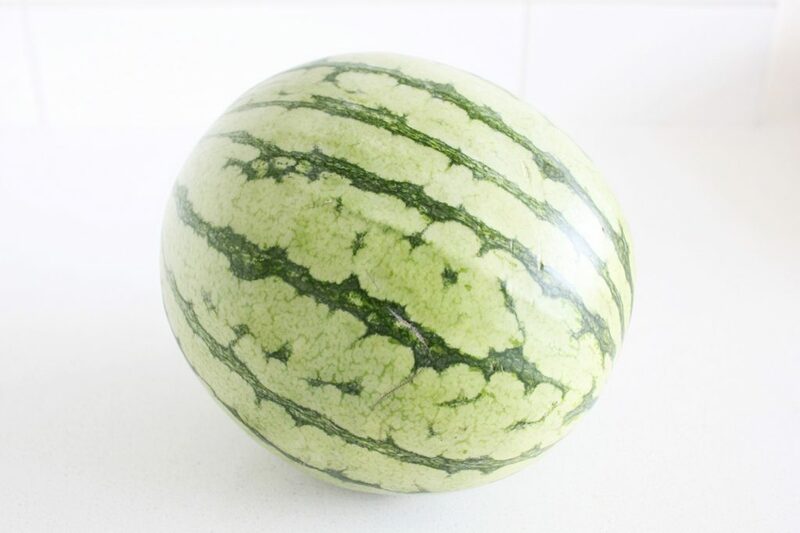 Watermelon tastes very sweet but is actually less sweet than most fruit, and is made up mostly of water. 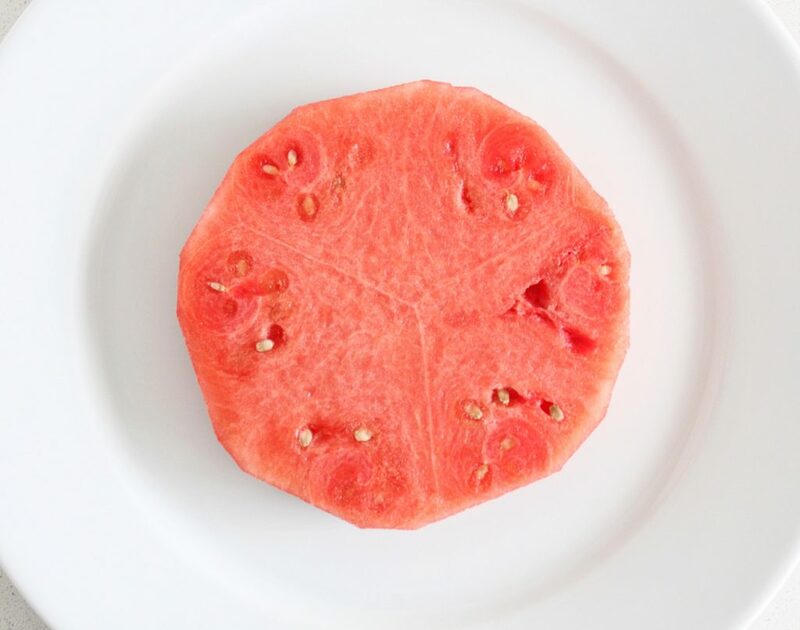 The pinky-red fleshed ones (they also come in yellow) are full of lycopene (like tomatoes! ), the red pigment-ed, well-known cancer-crushing antioxidant. Eating watermelon is a good way to get some hydration when water/liquids aren’t going down very easily. It is also good for edema, a common, uncomfortable cancer/cancer treatment side effect. 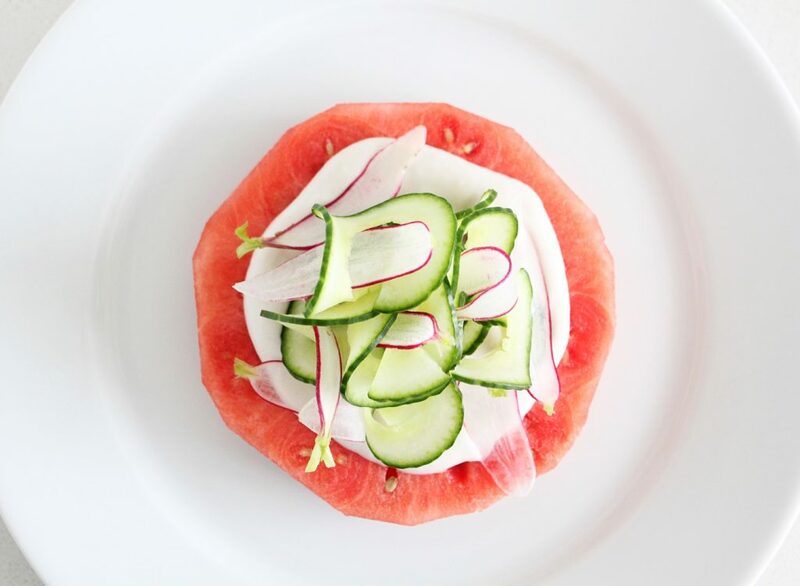 Pairing the watermelon with cucumber takes this to new cooling, hydrating heights. 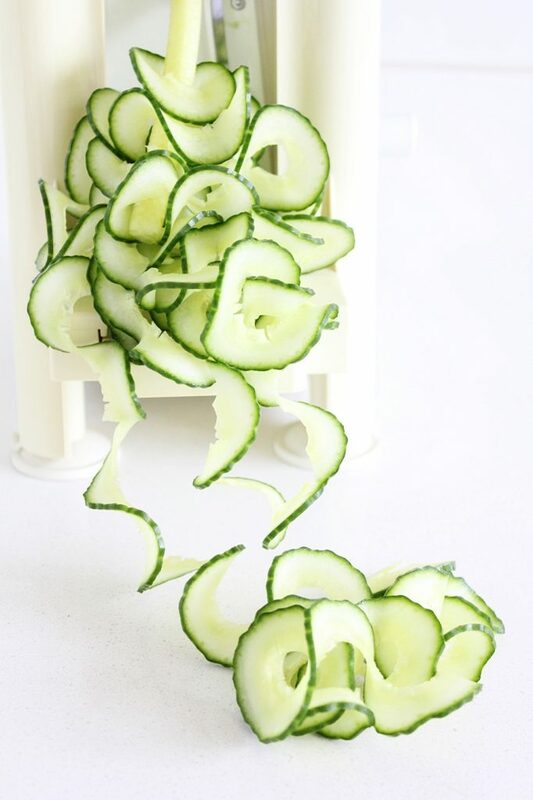 Cucumber is also less sweet, which takes the sweetness of the whole salad down a few notches. 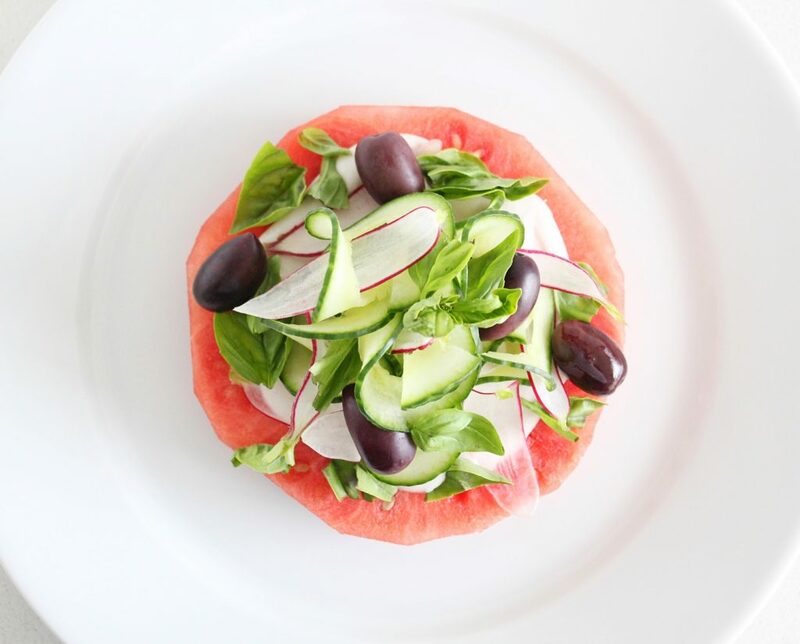 The olives add some salt, which helps the electrolyte balance of the salad (making it more effectively hydrating) and add a depth of flavour that just tastes really good. 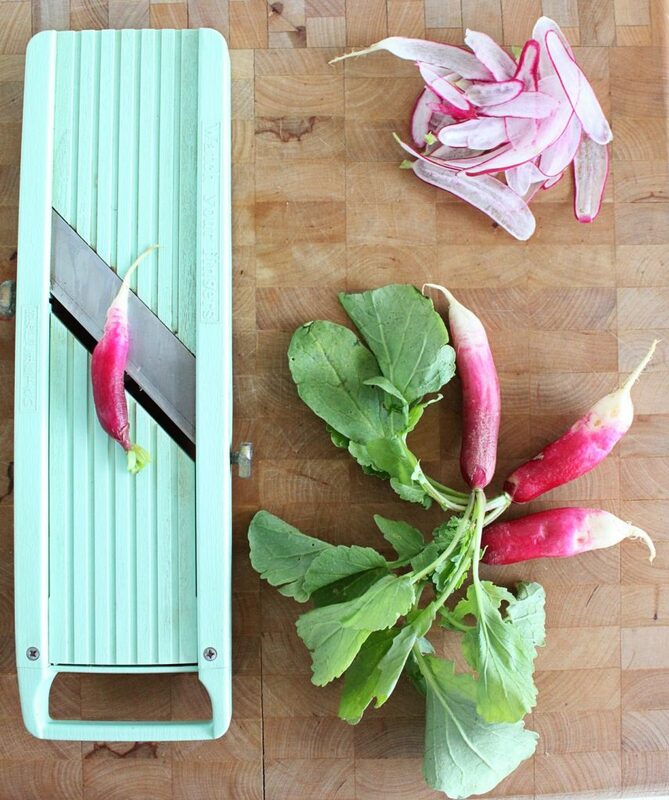 The radishes are cancer-crushing crucifers, but we were gong to invite them even before we thought of that. They help the salad make the real transition to vegetable-ville, are watery too, but challenge our palate in a more bitter and interesting way than the easy-going melons. Then there’s the yoghurt. I have used the insanely delicious Homemade Coconut Yoghurt recipe that we posted here last summer, but you can use your own recipe or your favourite brand of plant-based yoghurt, just read those ingredients and make sure there aren’t that many, and you know what they are. The fatty, creamy, sourness goes really well with all of that flat watery-ness (and along with the fatty olives,) slows down the absorption rate of the sugar into your bloodstream (f-cancer). Funny story, I really wanted fresh mint for this recipe but bought basil instead by accident. Guess what though, it’s still a really good (even sort of classic) combo, and many fresh herbs would also work in it’s place, so choose what you’re feeling like or even what you think your body might need (ie Mint –energizing and promotes circulation, Cilantro –remover of toxins, good for gas and nausea, Parsley –digestive aid, warming, anticarcinogen, antioxidant, Basil –antioxidant, anticarcinogen and warming, so maybe a good choice for a cool-ish rainy summer after all! Without meaning to, I made this salad look sort of fancy, but please don’t be deterred by that. It’s the combo of ingredients that make it taste so good, you could easily chop up all of the ingredients (think Greek salad!) and serve them with a dollop of yoghurt on top (or a smear on the bottom of the plate) and have the exact same final product. It will still be really pretty too. 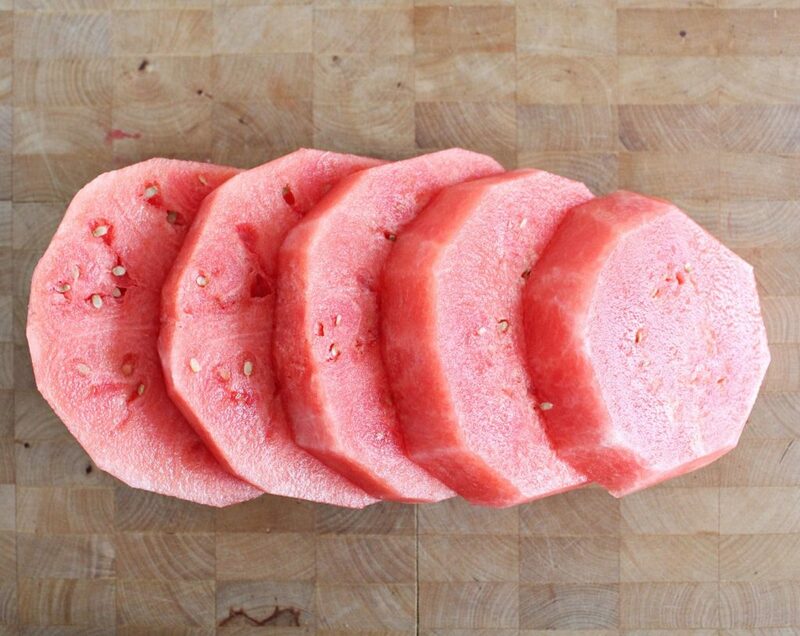 Cut both ends off of the watermelon and sit it upright on your cutting board. 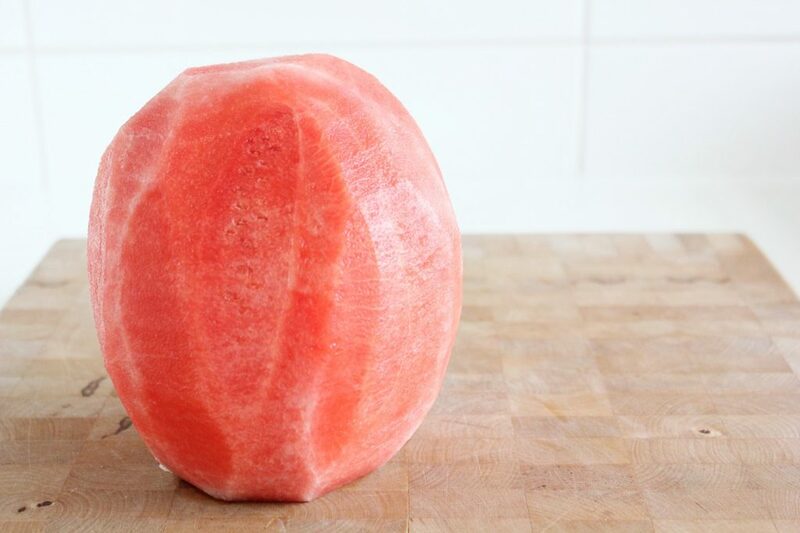 Using a large chef's knife, carve the sides off too, leaving round ball of pink watermelon. 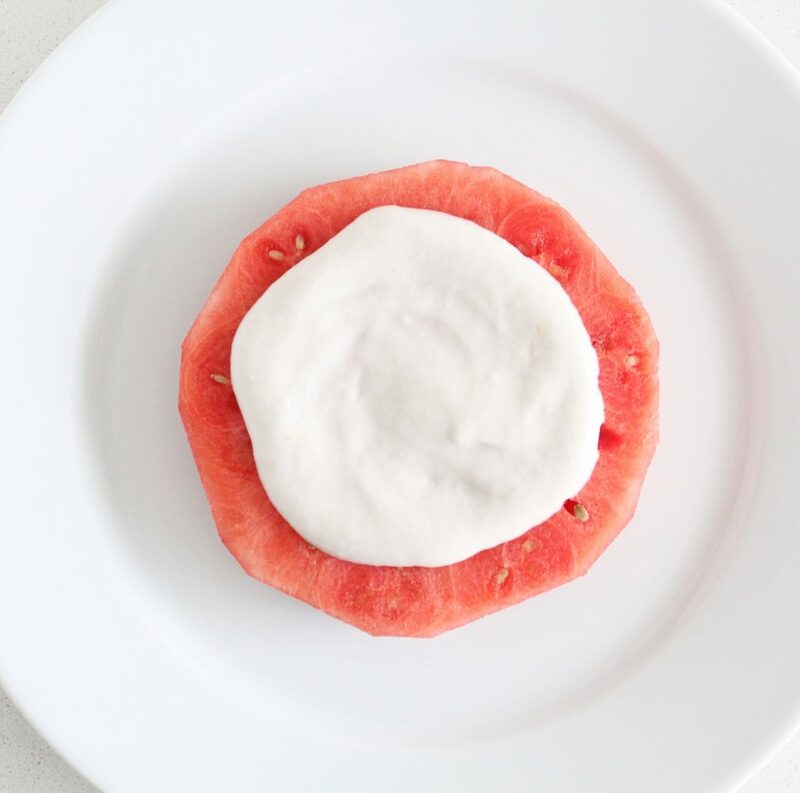 Cut the melon into horizontal, 1-2 inch rounds. Take one round and put it onto a plate. 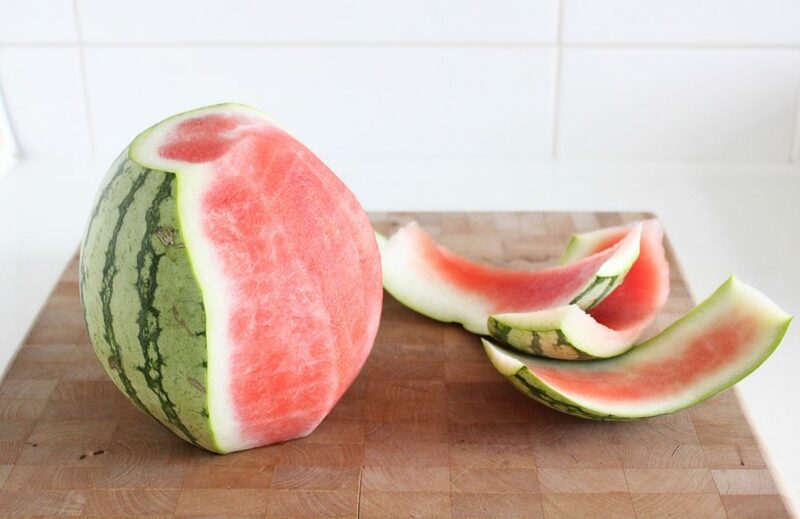 Spread the yoghurt onto it, leaving an inch of pink around the outside so that you can still see the watermelon. 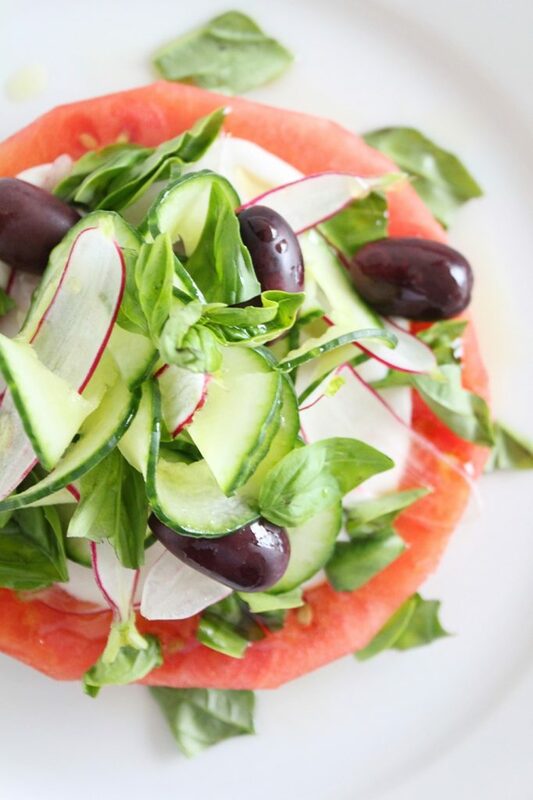 Top with cucumber, fresh herbs, olives and radishes. Drizzle on the lemon juice and olive oil. Sprinkle on some sea(weed) salt. 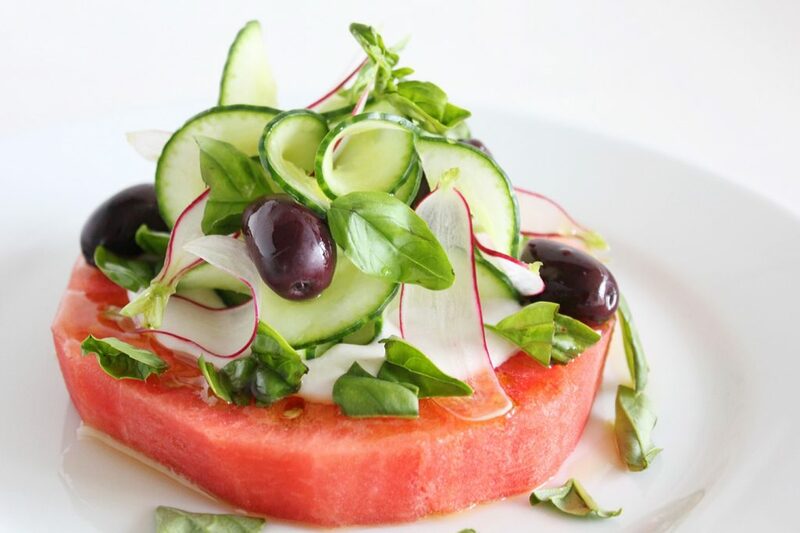 Dice up the watermelon, cucumber and radishes, toss them with the olives fresh herbs, lemon and olive oil and serve on top of a smear of yoghurt.